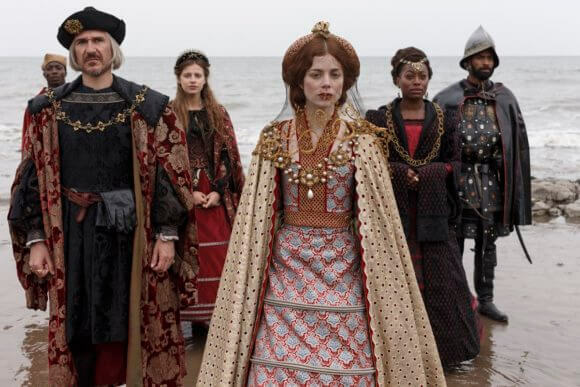 Starz just released the official trailer for The Spanish Princess, the third series based on the critically acclaimed novels by Philippa Gregory. The Spanish Princess, based on Gregory’s The Constant Princess and The King’s Curse, will premiere on Sunday, May 5, 2019 at 8pm ET/PT. The Spanish Princess follows Starz’s successful limited series The White Queen with Rebecca Ferguson and The White Princess starring Jodie Comer (Killing Eve). The Spanish Princess‘ cast is led by Charlotte Hope as Catherine of Aragon. Aaron Cobham (Cold Feet, Coronation Street) is Spanish soldier Oviedo, Dame Harriet Walter (The Crown, Call the Midwife) plays Margaret Beaufort, and Laura Carmichael (Downton Abbey, Marcella) is Margaret ‘Maggie’ Pole. Ruairi O’Connor (“Delicious”) takes on the role of young Harry who will become King Henry VIII. Elliot Cowan (Da Vinci’s Demons) plays King Henry, Alan McKenna (“Save Me,” The Hitman’s Bodyguard) is Richard Pole, Angus Imrie (The Kid Who Would Be King, Kingdom) is Prince Arthur, Alexandra Moen (“Fortitude,” “Dickensian”) plays Queen Elizabeth, and Georgie Henley (The Narnia franchise, The Sisterhood of the Night) plays Margaret ‘Meg’ Tudor. The White Queen and The White Princess‘ Emma Frost and Matthew Graham (Life on Mars, Electric Dreams) are the showrunners and executive producers. Colin Callender, Scott Huff, Charlie Pattinson, and Charlie Hampton also serve as executive producers. “Catherine of Aragon has generally been depicted negatively, as an unwanted and burdensome wife, so this story of her early years as a strong, driven young woman and shrewd political player is a fresh and untold tale. We are also especially pleased to be able to bring into the light the inspiring story of people of color in early Tudor England,” stated Emma Frost and Matthew Graham. “Returning to the world of Tudor royal court intrigue, The Spanish Princess is a vivid and captivating story told uniquely from the point of view of the women, which also sheds light on a previously untold corner of history: the lives of people of color, living and working in 16th century London.